On God's Footstool by Bruce Greene ~ The concept for "On God's Footstool" began several years ago when Janie and I were visiting the JA Ranch. The foreman took us to the top of Mitchel Peak which is the highest point in the Palo Duro Canyon. As the sun was setting, we watched a summer shower come across the huge expanse. It was a special time of the revelation of God and His creation. 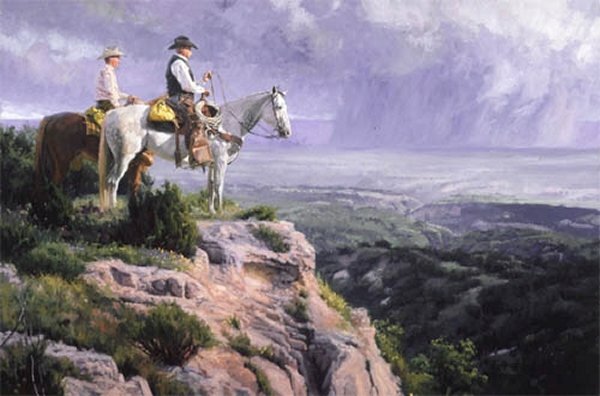 I chose to paint a good friend of mine and myself, on the crest of the peak, on horseback, and taking it all in.